“Pioneer single mothers trekked with their children for a six-month, two-thousand-mile wagon trip. 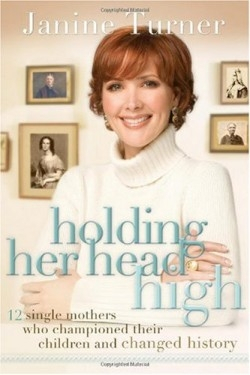 They sometimes rode, but many times they walked, encountering intense heat, freezing cold, floods, and droughts—sometimes all in one trip.” So writes actress Janine Turner about the life and times of Elinore Pruitt Stewart, an orphan who raised eight siblings. Elinore married the first man who asked, but left him for mysterious reasons during her first pregnancy. In 1909, longing for the “sweet, free open,” she took her two-year-old daughter to homestead in Wyoming. Her letters to her former employer in Denver, Colorado, make engaging reading for Laura Ingalls Wilder fans, women’s history enthusiasts, and now, because of Turner, single moms. Feminism is another of Turner’s themes, and it weaves through her text as she points out the accomplishments of the twelve women whose biographies comprise this book. The 1992 recipient of the Woman of Work Award from the National Commission of Working Women, Turner includes women writers, businesswomen, slaves, and royalty, contextualizing each one with an impressive historical survey of the time and place in which she lived. These historical chapters alternate with the biographies included in the book, masterfully bringing readers along on a fascinating journey that covers over two thousand years. When talking about faith, Turner can be plaintive and earnest, but she is also erudite and educational without being dull or academic. Imagine being pregnant and unmarried in Puritan New England as Susannah Durbin was. At that time, religious authorities often confiscated just-weaned babes from their mothers, taking them away naked because they believed that the baby’s clothes “were tainted by the mother.” Midwives were charged to listen carefully when an unmarried woman gave birth in the hope that the agony of childbirth without painkillers would induce her to reveal the baby’s father. In an earlier chapter about Roman times, Turner writes that unlike today, when birth control is available and childbirth is mostly safe, it was once quite different because “every expression of love” meant a potentially life-threatening pregnancy. Turner’s tales of single mothers in colonial and revolutionary America are especially intriguing. Elizabeth Timothy knew Benjamin Franklin and ran the first woman-owned publishing company while raising six children—as a single mom! When she was widowed in 1738, she ran her husband’s printing press and used it to challenge her contemporaries by printing stories “that dealt with the harsh treatment and punishment of slaves” in South Carolina. She also used her newspaper to promote the business dreams of another South Carolina single mother, Eliza Pinckney, who taught herself to raise indigo, an important cash crop that eventually became South Carolina’s economic mainstay. When Pinckney was widowed at the age of thirty-five, she raised her daughter and two sons. As adults, the boys fought with George Washington in the Revolutionary War. It’s fascinating how many of the women included in this book were also writers who used their talents to promote the cause of women everywhere. Fourteenth century single mom Christine de Pisan wrote poetry and letters, and was quite possibly the first European woman to support herself by writing. Nineteenth-century slave and memoirist Harriet Jacobs wrote out of a pressing need to share her story with the world, pleading from the heart about the injustices and indignities slave mothers faced. There is also Abigail Adams, whose letters to her husband chronicle both a fascinating life and an important articulation of the abilities and rights of women. The letters and poems of other women, such as eighteenth-century Scotswoman Isabella Marshall Graham, punctuate Turner’s pages, allowing readers to glimpse the hearts and minds of an impressive group women who persevered against tremendous odds to raise their children and rebuild their lives after numbing catastrophes. Even a non-Christian reader will be inspired by these stories of faith, endurance, and achievement because they make coming home from work and figuring out what to make for dinner in the twenty-first century seem not nearly so difficult after all.